While most people have probably heard the term “identity theft,” the scope of damage that can result is often underestimated. It’s not just about someone copying your credit card number and charging up a storm. It’s about the potential for fraud to be committed across a range of areas—potentially impacting your medical files, your taxes, and your overall credit rating. Identity theft is when someone steals critical personal information in order to commit fraud. This information could be as simple as your full name and birthday, or your Social Security number or medical insurance information. 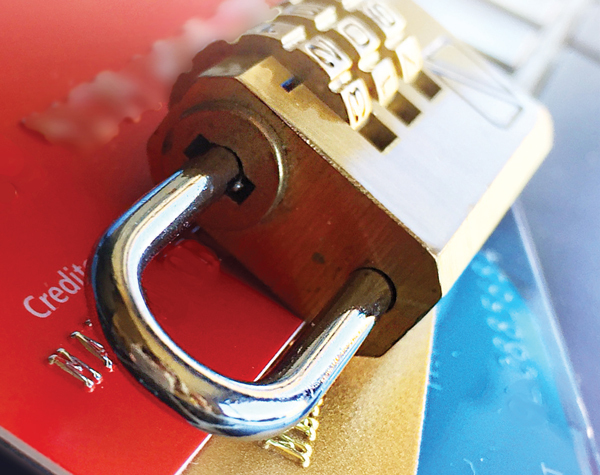 Thieves can open credit cards in your name, the nonpayment of which could negatively impact your credit rating. They could receive medical care, purchase prescription medication, or submit fake insurance claims. They could even file fraudulent taxes to get a fake refund, or use your tax information to get a job, and send Uncle Sam knocking at your door when they have a record of unreported income that isn’t actually yours. The fallout could mean significant time and effort on your part to clean up the mess. If, despite your efforts, you find out your identity has been stolen, you will need to report it to various organizations. Start with the Federal Trade Commission (FTC). If you report it to the FTC online you will receive a report and recovery plan, and you can also make an account online that will help you through the process, including templated letters that you can amend and send to creditors. If you don’t want to create an account, keep track of progress offline. You can also download information from the FTC website, including checklists for what to do, and sample creditor letters. Contact any impacted companies—including your banks if accounts were compromised, insurance companies if the thief stole your medical information, or the IRS if your taxes were impacted. Call all credit card companies where you think your card number was used (including retailer store cards) if you suspect someone has opened charge cards in your name. 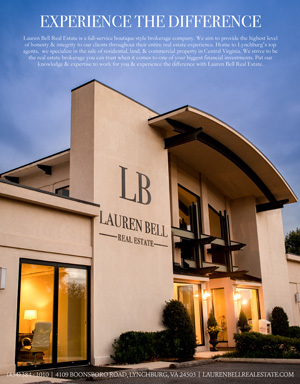 You may need to report the theft to local police, depending on what specific creditors require. You also need to report any ID theft to the three credit reporting agencies. You can request they set up fraud alerts, so that you are alerted to unauthorized requests for credit checks. Or, even better, freeze your accounts so that no one can get a credit report. You can always unfreeze if you need a report yourself. The good news? There are a number of actions you can take, and habits you can get into, to prevent thieves from gaining access to your identity. 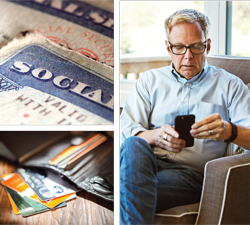 Keep your Social Security number secure at home. Don’t carry your card around, or write it on checks or bills. Only share it when absolutely necessary, and, if possible, offer some other form of identification, or use just the last four digits. Medicare users might be concerned that their Social Security number is on their insurance cards. However, not for long. The Medicare Access and CHIP Reauthorization Act requires Centers for Medicare & Medicaid Services (CMS) to remove Social Security numbers from Medicare cards by April 2019. CMS was scheduled to begin mailing new cards with Medicare beneficiary identifiers (MBIs) in May 2018. Empty your wallet or purse and decide what you really need to keep with you. Do you write that many checks that you need to carry blank checks with you? Leave checks at home to safeguard your bank routing number and account. Do you really need to carry more than one credit card? Leave all but one at home. How often do you actually use cash? Take out cash once a week and leave your ATM card behind. We’ve become accustomed to sharing our names and birthdays for a variety of silly reasons, including signing up for loyalty cards at the local grocery store or coffee shop. Do you truly need to get that free coffee on your birthday? If you don’t need to share your full name and full birthday, don’t. Use initials if possible, and forgo sharing your real birthdate. If you have an email address with your full name in it, you may want to save that for business use or for emailing personal friends and create an anonymous free email for more casual use, like for store sale emails or other marketing purposes. Don’t share anything private— including bank account numbers or credit card information—without knowing exactly who you are sharing it with. If someone calls or emails claiming to be from the credit card company, don’t automatically “confirm” information for them. Even if you get an email “alert” claiming fraud, question it. Don’t respond to the email or give information to the caller. Call your company yourself and see what they need. Having a healthy dose of skepticism is a good thing. Set calendar reminders to request free copies of your credit report. The three credit reporting companies—Equifax, Experian and TransUnion—must provide you with one free report each year. You can get these for free through Annual Credit Report. (Other companies offer the same services, but they may charge you.) Check for credit cards that you never opened, or loans you never applied for—which could signal fraudulent use of your identity. Stagger your credit report requests, getting one from each every four months, so you are checking your credit on a rolling basis throughout the year. When you receive bills and account statements, go over them. Watch for anything unusual or that you can’t remember buying or paying for. One particularly interesting trick is for thieves to charge a small amount in an attempt to see if your stolen card number is valid before charging a larger purchase. So even if a $2 charge seems innocuous, if it looks unfamiliar, call your credit card company or bank to trace it. You should also check each “Explanation of Benefits” form you receive from your heath insurance company to make sure you have actually had all services listed. 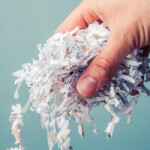 Instead of tossing paperwork in the trash, shred anything with personal information that you don’t need, including old bills, insurance letters, and receipts. Dumpster divers can take a tossed solicitation letter offering a new credit card and apply for it in your name. Check your mail promptly, and have it held when you travel, to avoid thieves stealing it out of your mailbox. Keep track of when your bills are due in the mail, and if a credit card statement is late, call the company. In fact, consider going digital, having bills posted online only and not mailed, and paying them online as-needed, thereby preventing anyone from intercepting your mail. When it comes to safeguarding yourself online, it’s relatively easy to be proactive. Choose complex passwords that contain capital letters, numbers and special characters, and make it hard for anyone to guess. If a company you do business with has a data breach, change your password immediately. If you use your smart phone for any personal business, set the highest security possible on your phone, even if it requires you to sign in more than you’d like. The fingerprint or face recognition ID available for unlocking smart phones is a great way to make signing in easy—but breaking in hard. On your personal computer at home, install virus-detecting software and firewalls (which you can either buy or, in some cases, download for free) to prevent hackers from breaking into your system. If you use must a public computer at all for personal use, be exceptionally careful not to “save” passwords. Clean the cache and delete all history before you log off. If you have personal Wi- Fi at home, make sure it’s password-protected, so no one can use your service, and never use free public Wi-Fi access to conduct financial transactions. Open connections allow thieves to break into your hardware. Credit card companies are extremely proactive in monitoring and catching fraudulent charges, and you are not usually liable for anything purchased with a stolen card. Given these built-in safeguards, it’s often safer to pay for things with your credit card instead of your debit card. Try to stick with retailers that you know. Thieves are notorious for hacking into the payment systems at gas stations and other open areas by “skimming”—that is, putting a hard-tospot sleeve over the swipe pad and illegally capturing your credit card number. The retailer wouldn’t even know it was happening. If the swipe pad looks loose or suspicious, alert the retailer station, and pay at the cashier. You can and should be vigilant about proactively safeguarding your information, to make it harder for people to steal your identity. When it comes to your protection, an ounce of prevention is definitely worth a pound of cure.